Upon visiting the blog of one of my favorite writers, Joe Posnanski, I found this post of his... with the image on the left. 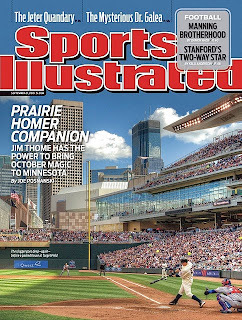 Man, as Posnanski writes... that's a sweet SI cover. While it's true that my blog is about writing, I've also had exception posts like this one on the movie Inception or this with video from the Olympics and this is quite the striking baseball shot.